Au dix-neuvième siècle, prolifèrent livres miniatures et curiosités. Les Bibles miniatures, résumés minuscules de la Bible, jouissent en particulier d’une immense popularité. Prévues au départ pour fournir aux enfants une présentation simplifiée des récits bibliques et de l’enseignement religieux, les Bibles miniatures illustrent la médiation du catéchisme par le biais de la culture matérielle. La présence et l’influence de groupes religieux dans le monde de l’édition, auxquelles s’ajoute la capacité nouvellement acquise des éditeurs à alimenter la demande de la classe moyenne en nouveautés en matière de livres pour enfants, créent un environnement dans lequel la popularité des Bibles miniatures atteint des hauteurs vertigineuses. Cet article commence par retracer le genre de la Bible miniature depuis son développement au dix-septième siècle jusqu’à son immense popularité à l’époque victorienne. Il examine la façon dont son aspect matériel, lié au « livre-jouet », combine jeu et enseignement. Cet essai étudie un exemple particulier de ce genre populaire, The Little Picture Testament, publié par Charles Tilt en 1839. Une description détaillée des éléments bibliographiques du livre familiarisera le lecteur avec cet ouvrage, et un bref résumé de ses conditions de production et de réception le situera ensuite dans les contextes matériel, culturel et religieux qui sont les siens. Enfin, cet essai examinera la façon dont The Little Picture Testament aborde et simplifie les complexités de la Bible tout en captivant son jeune public. In the nineteenth century, miniature books and curiosities proliferated; in particular, thumb Bibles, miniature synopses of the Bible, experienced widespread popularity. Intended to provide children with a simplified introduction to Biblical narratives and religious instruction, thumb Bibles illustrate the mediation of religious instruction through material culture. The presence and influence of religious groups in the publishing industry, paired with publishers’ new-found capacity to cater to middle-class demand for novelty children’s books, created an environment in which thumb Bibles’ popularity soared. This article begins by tracing the thumb-Bible genre from its development in the seventeenth century to its immense popularity in the Victorian era. It considers how their physical forms, connected to ‘toy books’, integrate play and religious instruction. This essay considers one example of this popular genre, The Little Picture Testament, published by Charles Tilt in 1839. A detailed description of the book’s bibliographic elements will familiarize the reader with the work, and an outline of its production and reception will then situate its literary production within its material, cultural, and religious contexts. Ultimately, this essay considers how The Little Picture Testament confronts and condenses the intricacies of the Bible, all while captivating its child audience. Research for this article was undertaken with support from the Social Studies and Humanities Research Council of Canada. I would like to express my immense gratitude to Dr Alison Chapman for her support in revising this article during her publication boot camp of May 2015. Warm thanks are also due to Cahiers Victoriens et Édouardiens’ guest editors for providing helpful advice for the article’s improvements. 1In the nineteenth century, miniature books and curiosities proliferated; in particular, thumb Bibles, miniature synopses of the Bible, experienced widespread popularity across Europe. Intended to provide children with a simplified introduction to Biblical narratives and religious instruction, thumb Bibles illustrate the mediation of religious instruction through material culture: many were printed and bound in fine materials, adorned with illustrations, presented in miniature wooden bookcases, and marketed as gift objects. The presence and influence of religious groups in the publishing industry, paired with publishers’ newfound capacity to cater to middle-class demand for novelty children’s books, created an environment in which thumb Bibles’ popularity soared. My focus will be on one example of this popular genre, The Little Picture Testament, published by Charles Tilt in 1839. 2Despite being a popular form of Victorian children’s and religious literature, the thumb Bible has only recently garnered attention from scholars. Sydney Roscoe’s Early English, Scottish, and Irish Thumb Bibles (1973) marks the first significant study of its kind. Roscoe delineates the boundaries of the genre and identifies specific influential works and editions. Following Roscoe, Ruth Adomeit defines the field in Three Centuries of Thumb Bibles: A Checklist (1980). Based on her years of collecting, this authoritative bibliography addresses the major challenge in studying thumb Bibles—that interest traditionally lies with private collectors rather than academic researchers—and calls for further co-operation and study. While The Little Picture Testament does not appear in either of these bibliographies, it is a remarkable specimen of the genre. This article responds to Adomeit’s appeal for further study of thumb Bibles and strives to unite an investigation of these tiny books’ material form with a literary analysis of their content. 3Thumb Bibles had existed for over two hundred years when Tilt produced his The Little Picture Testament. The earliest known thumb Bible, Agnus Dei, appeared in London in 1601; this rhymed account of Christ’s life was joined shortly by Verbum Sempiternum and Salvator Mundi, both produced by John Taylor in 1614 and 1640, respectively. These early verse thumb Bibles were bound either in leather with fine metal clasps or in boards. Little changed in the genre over the next hundred years, with most new thumb-Bible printings consisting of type resettings or new editions of previous texts. After the 1727 production of the first prose thumb Bible, the genre saw greater textual variation and, very significantly, the addition of illustration. Ultimately, two technological advances account for the dramatic changes in these texts’ qualities in the Victorian era: cloth binding and wood engraving. 4The development of cloth bindings in the 1820s and 1830s provided a durable and inexpensive alternative to leather, effectively reducing by half the production cost of a miniature text; this decreased cost meant that publishers could target a wider audience, especially the emergent middle class with its newly disposable income. Details such as gilt pages and embossed covers provided a sense of luxury and gravitas. Meanwhile, the development and proliferation of wood-engraving techniques facilitated the widespread and inexpensive production of illustrated works. 5Wood engraving (that is, the practice of engraving images with a burin on a piece of wood cut across the grain) allowed artists to produce cleaner and more consistent lines in smaller images than the woodcut process (which worked with the grain of the wood). Moreover, the use of wood blocks of the same height as movable type meant that publishers could print both image and text at the same time, reducing costs. For the thumb-Bible genre, these advancements meant that illustrations could depict detailed scenes from the Bible; artistic attention could be paid to background characters and settings, rendering a more realistic representation; and more illustrations could be included in a single book. All of these changes made thumb Bibles more attractive for their child readers. Amply illustrated, thumb Bibles could now serve as gifts for children who were too young to read or for those just learning to do so. 6The physical form of The Little Picture Testament integrates religious instruction with contemporary play activities, practices that may otherwise appear at odds. As is the case for many miniatures, the fascination of a thumb Bible lies in its invitation to engage in both physical and intellectual possession. In his contemplation of the miniature, Steven Millhauser specifies that ‘the very fact of smallness demands in us an increased attention’ (131); indeed, its ability to seize attention defines the miniature’s success: ‘The miniature strives toward the ideal of total imitation. The more precise, the more wonder-compelling’ (132). I would like to posit another reason why these miniature abridgements reached such popular levels in the mid-nineteenth century: the popularity of dollhouses—or, as they were more commonly referred to, baby houses. 7Although baby houses had existed since the sixteenth century, mass-produced dollhouses for children reached their peak of popularity at the same time as thumb Bibles. By the 1820s, consumer culture transformed dollhouses from a hobby for the adult elite to a staple of the middle-class nursery. Moreover, beginning in 1800, publishers such as John Marshall created collections of miniature ‘toy books’, sold with matching bookshelves and marketed for use in dollhouses. The miniature libraries of early publishers were soon replicated by market competitors who made use of cheap materials and labour costs to profit from the increasing popularity of dollhouses and the subsequent demand for accessories. 9The genre of the thumb Bible, very significantly, mobilized the appeal of the miniature play object but without any associations with moral license. 10Tilt’s The Little Picture Testament combined religious instruction with personal enjoyment to introduce its child readers to the complex narratives and moral issues of the Gospels. The earliest copies of The Little Picture Testament appeared sometime between 1830 and 1839.1 Bookseller and publisher Charles Tilt published the text in London in collaboration with fellow bookseller Charles Whittingham. It contained forty-eight wood engravings as accompaniments to its forty-seven chapters: in the image ‘John Baptizing Christ’, the fine vertical folds in Jesus’ robes demonstrate the tidy, consistent lines made possible by wood-engraving techniques (fig. 2). The book was originally produced in the series Tilt’s Hand-Books for Children alongside The Little Picture Bible, a similar text recounting the tales of the Old Testament and four other non-religious titles; each was priced at one shilling and sixpence (Child n. pag.). 11An 1841 advertisement from Tilt and Bogue’s Annual Catalogue promotes ‘A neat Case, lettered “MY OWN LIBRARY”, and containing eight of the “Hand-Books”’, which could be purchased for fourteen shillings (9). Although the publisher identifies Isabella Child as the author, the lack of information available on this author and the numerous copyright and remuneration disputes in which Tilt was involved suggest that the name is likely a pun or pseudonym for an otherwise uncredited author. Publication dates were not printed on these or subsequent editions, leading individual libraries to estimate initial publication dates by using inscriptions within individual copies. By 1840, multiple American publishers began producing their own editions of the text in New Haven, Philadelphia, and New York. The latest known editions of this text were produced in the 1870s. Contemporary critical reviews appeared in the Evangelical Magazine and Missionary Chronicle and the Baptist Magazine in 1839 and in the Wesleyan-Methodist Magazine in 1841. After this date, no critical or scholarly engagement with The Little Picture Testament survives. Fig. 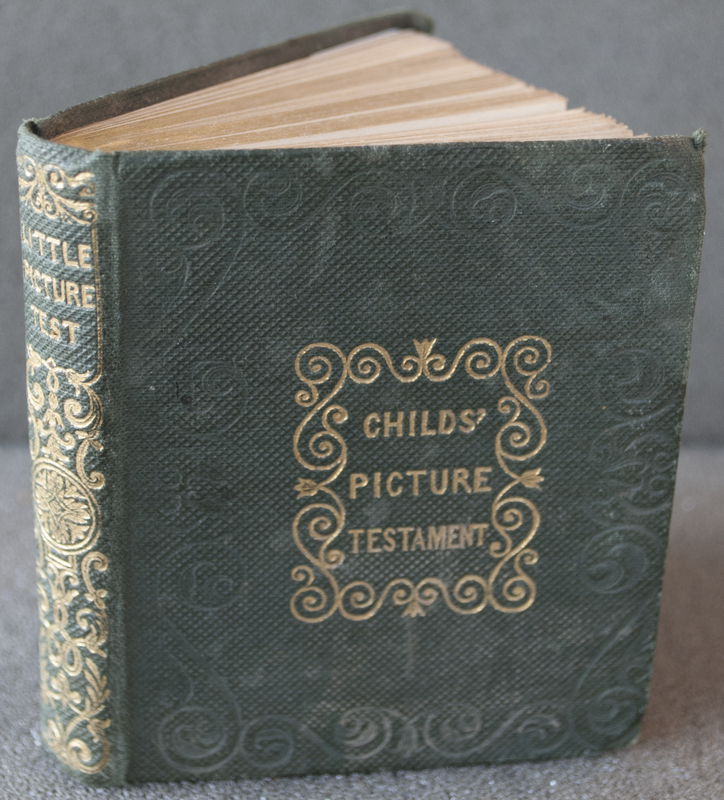 2: Isabella Child, The Little Picture Testament (1839). John Baptizing Christ. Reproduced courtesy of University of Victoria Special Collections. Fig. 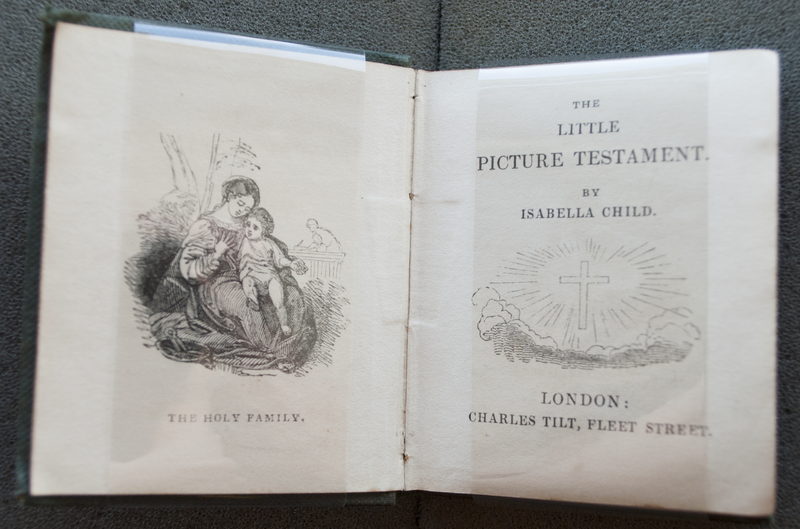 3: Isabella Child, The Little Picture Testament (1839). Book Cover. Reproduced courtesy of University of Victoria Special Collections. 13The last page contains an advertisement for Tilt’s Hand-Books for Children including the first six titles in the series. The hybrid nature of The Little Picture Testament as a miniature toy book explains why its size, 78 millimetres tall by 65 millimetres wide, exceeds those of typical thumb Bibles, resulting in its absence from Adomeit’s Three Centuries of Thumb Bibles: A Checklist, despite her owning at least one copy of the book.3 The remarkably unworn condition of the copy held in the University of Victoria’s Special Collections suggests that the book was used for display purposes more often than for reading or handling. 14The physical features and marketing of The Little Picture Testament suggest a link between the thumb-Bible and toy-book genres. Three years before the publication of Tilt’s Hand-Books for Children, Tilt produced and marketed a similar collection entitled Tilt’s Miniature Classical Library; these works were bound in embossed cloth, silk, or calf—accommodating various budgets—and sold with an ‘elegant Morocco case, with glass front and neatly ornamented . . . as to form a most tasteful ornament for the chimney-piece or side table’ (‘List of Works’ 144).4 Unlike that of previous, more expensive miniature collections, the cost of these works—as little as one shilling and sixpence for cloth bindings—suggests actual physical use by their intended child audience; indeed, an advertisement in the Gentleman’s Magazine suggests that the books were ‘admirably adapted for Presents or School Prizes’ (‘Just Published’ 117). Despite following John Marshall’s first miniature library by thirty-seven years, Tilt’s Miniature Classical Library advertised that ‘the popularity of this series has called into existence a variety of spurious imitations, got up in an inferior style’ (117). In any case, the Classical Library sold tremendously well, appearing in dozens of Tilt’s catalogues and advertisements and selling 246,600 copies at a profit of £5,651 by 1842 (Publishers Association 475). Although no such information survives for Tilt’s Hand-Books for Children, we can assume that it too experienced success, if perhaps on a lesser scale: the collection appears in advertisements in similar publications, including the Literary Gazette, the Publishers’ Circular, and the Gentleman’s Magazine, alongside gift books, juvenile works, and books of devotion; it was bound in similarly ornamented cloth and sold for the same price, one shilling and sixpence; and it also includes a leather-bound wooden bookcase for display purposes. In addition to these similarities, Tilt’s Hand-Books for Children included more illustrations, an appealing feature for young readers, as well as endorsements by several religious magazines for The Little Picture Bible and The Little Picture Testament. The book was sold by American publishers such as Durrie and Peck as late as the 1850s; it is unclear whether Tilt sold the distribution rights or the text was simply pirated. 15Victorian evangelical authors and publishing houses produced vast amounts of literature for a wide variety of audiences; religious tracts and theological works were produced as well as periodicals, novels, poetry, and children’s literature. According to Patricia Demers, ‘the amazing circulation of this work and the breadth of its support mean that it is also an important lens through which to view—and attempt to understand—ideas and attitudes, markers and institutions, and specific works and creators’ (229). Most scholarship on this period has relied on religious tracts or periodicals for understanding how the Bible was interpreted by evangelical denominations; while these studies are useful, an examination of specific thumb Bibles offers the possibility of analyzing interpretations of Biblical passages since their chapters directly parallel narratives from the Bible, despite extensively abridging them. A thumb Bible produced in 1822 explains how these abridgments were undertaken: ‘the utmost care has been taken not to omit any material event, nor pervert in anywise the doctrines contained in the inestimable treasure. The illustrations . . . will convey to the young mind in a much clearer manner the various remarkable transactions contained in the Holy Bible’ (qtd. in Adomeit, Three Centuries of Thumb Bibles xiv). Thumb Bibles thus do not merely represent the textual or narrative elements of the Bible; rather, they convey specific doctrines and religious connections. 16The Little Picture Testament’s specific abridgement of the Bible provides internal evidence suggesting its evangelical leanings. Tilt’s firm (known for producing non-religious works such as illustrated gift books, annuals, and almanacs, as well as travel books, editions of classics, and children’s literature [Browning]) published a variety of religious texts by well-known evangelical writers and preachers in addition to religiously informed commentaries on social issues such as slavery and colonization. Both Tilt’s religious and non-religious publications were regularly advertised in the Evangelical Magazine and Missionary Chronicle and other devotional periodicals. Reviews and advertisements for this text appear in the Evangelical Magazine, the Wesleyan-Methodist Magazine, and the Baptist Magazine, as well as Tilt and Bogue’s Annual Catalogue. These advertisements praise the aesthetic value of The Little Picture Testament but also applaud its textual and visual representations of scripture. While the Evangelical Magazine noted the usefulness of ‘numerous illustrations of Bible History’ (‘Works’ 28), the Wesleyan-Methodist Magazine focused on the presence of ‘Scripture narratives’ (Mason 145). The text’s positive reception by religious periodicals suggests that even if it was not intentionally written to satisfy evangelical denominations, it did coincide with their belief practices. 17Specifically, The Little Picture Testament reflects the four qualities of evangelical faith outlined by historian David W. Bebbington—biblicism, conversionism, crucicentrism, and activism—by textually and visually depicting specific Biblical passages and adapting the language used in these passages. Nineteenth-century evangelicals emphasized a direct relationship with the Bible over a devotion to religious rituals. According to Bebbington, evangelicals’ devotion to the Bible was ‘the result of their belief that all spiritual truth is to be found in its pages. The Bible alone, John Wesley contended, was the source of his doctrine of Salvation’ (12). The Little Picture Testament reinforces the relationship between the spiritual reader and the Bible through active, direct address of the child reader. The simplicity of its question-and-response structure prepares its readers for the more complex questions relating to religious doctrine that they will likely encounter and implies that self-reflection and the process of asking questions while reading the Bible are critical to understanding its implications. In some passages of The Little Picture Testament, evangelical doctrine appears clearly in the abridged and adapted versions of the text. For example, in ‘Lazarus and the Rich Man’s Gate’, The Little Picture Testament highlights the importance of the Bible by rendering the passage ‘they have Moses and the prophets; let them hear them. . . . If they hear not Moses and the prophets, neither will they be persuaded’ (Luke 16: 29–31) as ‘they have the Bible and people to teach them what is right, if they will not hear them, they will not be persuaded’ (Child 123; emphasis added). In the process of adaptation, the emphasis in this passage, and therefore the implied authority for constructing religious meaning, shifts from religious leaders and instructors to the Bible and the people who interpret it. 18Although The Little Picture Testament is not explicitly anti-ritualistic, the language employed in ‘The Last Supper’ and the visual representation and description of Jesus’ baptism clearly conflict with contemporary rituals of both Catholics and Baptists. During ‘The Last Supper’, Jesus blesses the bread and wine as an ‘emblem of his body . . . [and] emblem of his blood, which was shed to put away sin, and told them to eat and drink it in remembrance of him’ (135; emphasis added); this metaphorical interpretation of the Bible directly contradicts the Catholic doctrine of transubstantiation, which interprets the wine and bread as transforming into the literal blood and body of Christ. 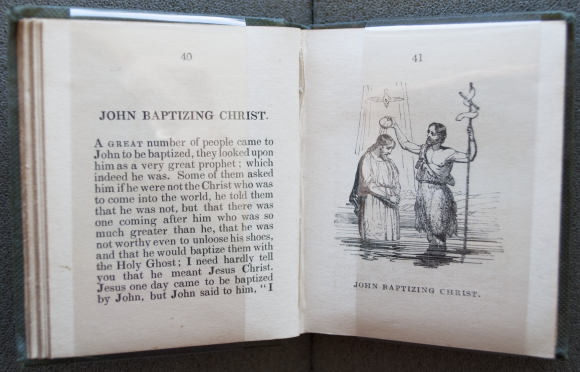 Moreover, the illustration ‘John Baptizing Christ’, which depicts a partial baptism of Christ, contradicts the full-body immersion used by Victorian Baptists. The Baptist Magazine condemned this image, describing it as ‘the representation of John standing in a stream, which flows just over his ankles, and pouring water out of a basin upon the head of Jesus’ (‘Brief Notices’ 20). Indeed, the magazine called for Baptist parents to ‘cut out’ the image to ‘prepare’ the book for children (20)—a call that emphasizes the perceived importance of these toy Bibles in religious instruction as well as the child’s or parents’ identification with a particular denomination. 19Victorian evangelicals emphasized conversion, or the recognition of Jesus as Saviour; this conversion might take form as a sudden epiphany or a gradual recognition. The Little Picture Testament emphasizes the theme of conversion within the New Testament by textually and visually referring to Biblical passages depicting conversion and by emphasizing the language of conversion within these particular passages. It visually distinguishes between believers and non-believers by means of their physical positions, relative to Jesus, in the wood engravings that accompany each chapter. In the images depicting his ministry, believers generally kneel, sit, or stand lower than Jesus, while non-believers stand above him. This pattern is most conspicuous in the images depicting Jesus’ miracles, particularly the image that accompanies ‘Christ Feeding the Five Hundred’ (Child 89).5 In the images accompanying both ‘Nicodemus’ and ‘The Woman of Samaria’, Jesus sits, while the other figure stands before him; these images visually represent these characters before their conversions and thus the evangelical emphasis on ‘the belief that lives need to be changed’ (Bebbington 2). 20In ‘Nicodemus’, the narrator focuses on the scepticism and eventual conversion of the Jewish ruler. Despite hearing ‘wonderful accounts’ of Jesus’ actions and thinking that Jesus must really ‘come from God’, Nicodemus must undergo a spiritual reawakening in his encounter with Jesus (Child 56); Nicodemus’s status as believing, and yet not fully believing, is represented visually in the wood engraving that accompanies this chapter. In the image, Nicodemus sceptically approaches Jesus with quizzical eyebrows and crossed arms while Jesus speaks with open arms; Jesus’ divinity is openly expressed by the beams of light radiating from his head (Child 57). Jesus tells Nicodemus ‘that every one [sic] who would believe in him, should be saved, and live forever in Heaven’ (Child 59). Nicodemus’s recognition of this reality signifies his shift from sceptic to believer. ‘The Woman of Samaria’ expresses a similar conversion narrative. In this chapter, ‘Jesus talked to [the woman] for a long time, and told her that he was the Messiah, or Deliverer, whom God has promised to send to the world. He also told her many things which she had done, so she went to the city’ to bring her friends to Christ (Child 63). In this passage, conversion is significant not only because it marks the acceptance of Jesus as the Saviour, but also because it precedes the sharing of God’s word and ultimately facilitates more conversions—a common trope in evangelical denominations. When the friends of the woman come and speak with Jesus, they profess, ‘now we believe, not because of what you told us, but we have seen him ourselves, and know that this is indeed the Christ, the Saviour of the world’ (Child 63). 21While The Little Picture Testament draws primarily on the four Gospels from the New Testament, it is strongly influenced by the Gospel of John and includes many of the conversion stories featuring exclusively in this account of Jesus’ life; this selection may indicate the text’s evangelical leanings since Victorian evangelical authors and preachers tended to favour the Gospel of John. Both Hannah More and Christopher Wordsworth openly preferred the literary style and themes presented in the Gospel of John; as Wordsworth wrote, ‘John’s gospel completed and authenticated the “Evangelical canon”’ (97). Moreover, James Culross, a contributor for the Religious Tract Society, argued that ‘to the child [John’s gospel] is the easiest, to the mere logician the most perplexing of the books of the New Testament’ (qtd. in Wheeler, St John and the Victorians vi). Contemporary surveys found that the Gospel of John was the most popular source for religious sermons, likely due to its emphasis on Christ as divine and its recollection of several conversion stories (Bebbington 13). 22The Little Picture Testament repeatedly emphasizes the holiness and deliberate suffering of Jesus Christ for the salvation of children and humanity; this focus accords with the evangelical movement’s focus on the doctrine of the cross within the gospel, or, in Bebbington’s term, ‘crucicentrism’. Evangelical belief dictated that ‘the reconciliation of humanity to God, that is to say, achieved by Christ on the cross is why the Christian religion speaks of God as the author of salvation’ (Bebbington 14). According to the narrator in ‘The Introduction’, The Little Picture Testament ‘chiefly tells about JESUS CHRIST, the kindest and most loving friend that little children ever had. One who, though he could have always lived happy in heaven, yet for their sakes came down to earth and suffered and died, that they might dwell forever with him in Paradise’ (Child 7). The redemptive quality of Jesus’ suffering is reflected at the beginning and end of The Little Picture Testament. In ‘The Annunciation’, an angel tells Mary that ‘she should have a son, and that his name should be called Jesus’ (Child 9). The text then deviates from the passage in the Gospel of Luke by introducing Mary to Jesus’ eventual fate (Luke 1); the angel states ‘that Jesus would be put to a very painful death, not on account of his own sins, but for the sins of a wicked and ungrateful world’ (Child 9–11). Before Jesus makes a physical appearance in the text, then, the child reader understands his eventual fate and why it is necessary. The central narrative, which details Jesus’ compassion rather than his suffering, is thus framed by this crucicentrist context. In ‘The Agony in the Garden’, Jesus prays ‘that if it were possible, he might be saved from death’ (Child 141–43). The text alerts the child reader about Jesus’ death from the beginning of the narrative and communicates the need for his pain and suffering; The Little Picture Testament thus focuses attention on the crucifixion and its immediate aftermath in its selection of represented Biblical passages. 23Both textual and physical elements of The Little Picture Testament privilege and facilitate active participation and sharing of faith, echoing nineteenth-century evangelicals’ zeal and religious activism. The presence of two non-Gospel narratives in The Little Picture Testament signifies the theme of activism while concluding its narrative. The last two chapters, drawn from The Book of Acts, highlight the sermons and subsequent conversions that occur after Jesus’ resurrection in ‘The Descent of the Holy Spirit’ and ‘The Conversion of St Paul’. ‘The Descent of the Holy Spirit’ describes the sermon that Peter performs in order to convert three thousand individuals. While in Acts Peter’s preaching is described in equal detail to the conversion of the three thousand, The Little Picture Testament devotes most of its summary to Peter and his sharing of God’s message: ‘He talked to them about Jesus, and told them to repent and believe in him, and then they would be saved’ (Child 187). This passage emphasizes active sharing rather than passive receiving. Specifically, this passage introduces the terminology ‘sermon’, a word that does not occur in the King James Bible, as the act of teaching ‘to believe in Jesus Christ and to love him’ (Child 187). Similarly, in ‘The Conversion of St. Paul’, which provides the basis of the final chapter in this text, Saul’s recognition of Jesus is significant not only because it facilitates his salvation, but also because it precedes his ministry. His sight restored, he ‘went and preached that Christ was the Son of God’ (Child 190). 24By combining elements of play activity with religious instruction, The Little Picture Testament reflects the permeation of evangelical values into domestic life. Within the context of play, the narrative authority of this book shifts from parents or guardians to children; children embrace the role of religious instructor. As children develop a more secure intellectual grasp of the significance of the Bible, they may begin asking their dolls, friends, governesses, teachers, or family members the questions embedded in the text. Therefore, the text associates pleasure and play with preaching, a fundamental aspect of evangelical faith. 25In this context, The Little Picture Testament serves not to replace the full-sized Bible, but to precede and enhance its reading. The presence of a Bible in a miniature library not only ensures accuracy in the contents of the dollhouse, but also introduces moral lessons into otherwise secular play habits. The categorization of this book as a play object explains why contemporary reviews in the Evangelical Magazine and Missionary Chronicle and the Baptist Magazine discuss children using the text, rather than reading the text (‘Works’ 28; ‘Brief Notices’ 20). As part of the thumb-Bible genre, The Little Picture Testament entices further religious study by those who may otherwise be unacquainted with the complexities of the Bible; moreover, it confronts the overwhelming scale of religious realities and condenses such realities into a form that could be physically and intellectually grasped by its child audience—and it does so in a material environment that encourages readers’ consideration of their broader relationships. 26The charm of The Little Picture Testament lies in its ability to fulfil a variety of desires: for those seeking to enhance the miniature furnishings of their dollhouse, both the individual work and ‘My Own Library’ series offered an inexpensive yet visually attractive decoration; for those looking for religious instruction, it provided a simplified version of Biblical stories in a physically enticing format; for those hoping to mitigate the possibility of sin in unsupervised child play, it introduced a moralizing reminder of religious tradition; finally, and perhaps most importantly, for those with less defined ambitions, it provided delightful illustrations and amusement. The changes to material and print culture during the Victorian era account for the abundance of thumb Bibles in the period, while the increasingly diverse interpretations of the Bible account for their remarkable diversity. As an exemplar of the thumb-Bible genre, The Little Picture Testament had an impact that far exceeds its diminutive size. Adomeit, Ruth E. Three Centuries of Thumb Bibles: A Checklist. New York: Garland, 1980. Print. Armstrong, Frances. ‘The Dollhouse as Ludic Space, 1690–1920’. Children's Literature 24.1 (1996): 23–54. Web. 26 Jan. 2015. Bebbington, David W. Evangelicalism in Modern Britain: A History from the 1730s to the 1980s. London: Routledge, 1993. Print. ‘Brief Notices’. Baptist Magazine 4.2 (1839): 20. Print. Browning, Logan Delano. ‘Tilt, Charles (1797–1861)’. Oxford Dictionary of National Biography. Oxford: OUP, 2004. Web. 30 Oct. 2014. Chen, Nancy Wei-Ning. ‘Playing with Size and Reality: The Fascination of a Dolls’ House World’. Children's Literature in Education 46.3 (2015): 278–95. Print. Child, Isabella. The Child's Picture Testament. London: Charles Tilt, ca. 1839. Print. Demers, Patricia. ‘Sunday School Moralists’. From Instruction to Delight: An Anthology of Children's Literature to 1850. Ed. Patricia Demers. Toronto: OUP, 2008. 228–31. Print. Gascoigne, Bamber. How to Identify Prints. London: Thames & Hudson, 2004. Print. The Holy Bible. King James Bible Online. Cambridge Edition: 1769. N.p, 2014. Web. 30 Oct. 2014. King James Vers. ‘Just Published’. Gentleman’s Magazine and Historical Chronicle 7.6 (June 1837): 117. Print. ‘List of Works Published in TILT’S MINIATURE CLASSICAL LIBRARY’. The Comic Almanack for 1839: An Ephemeris in Jest and Earnest, Containing ‘All Things Fitting for Such a Work’. London: Charles Tilt, 1839. Print. Mason, John. ‘Book Reviews’. Wesleyan-Methodist Magazine 3.21 (1841): 145. Print. Millhauser, Steven. ‘The Fascination of the Miniature’. Grand Street 2.4 (1983): 128–135. Print. ‘Miniature Libraries from the Children's Books Collections’. Victoria and Albert Museum: Online Collections. Victoria and Albert Museum, n.d. Web. 19 Oct. 2014. Price, Leah. How to Do Things with Books in Victorian Britain. Princeton: Princeton UP, 2012. Print. Publishers Association, Booksellers Association of Great Britain and Ireland. ‘Charles Tilt, Publisher, 1826 to 1842’. Publisher 126 (1927): 475. Print. Tilt and Bogue’s Annual Catalogue. The Principles of Gothic Ecclesiastical Architecture. Writ. Matthew Holbeche Bloxam. 5th edition. London: Tilt and Bogue, 1843. 229–42. Web. 12 Oct. 2014. Wheeler, Michael. St John and the Victorians. New York: Cambridge University Press, 2011. Print. ‘Works Recently Published’. Evangelical Magazine and Missionary Chronicle 17 (1839): 28. Print. 1 The text bears four alternate titles: Childs’ Picture Testament, Little Picture Testament, Mrs Childs’ Little Picture Testament, and, on the spine of the book only, Little Picture Test. 2 This represents my best effort to decipher the inscription; the dedication is the only sample of the hand. 3 Indiana University’s Lilly Library holds six copies of The Little Picture Testament ‘from the library of Ruth E. Adomeit, with her bookplate’ (‘Thumb Bibles of Western Europe’). 4 Where original publications lacked pagination, I have referenced the digitized page number available on Google Books. 5 Later, on the image depicting Jesus wearing the crown of thorns, two Roman soldiers kneel before Jesus, laughing and thereby mocking the belief of the converted Jews (153). Alyssa Currie is a Master’s candidate at the University of Victoria, where she specializes in eighteenth- and nineteenth-century literature. Her research interests include print culture, childhood, and social change; specifically, she is intrigued by illustration and miniaturization of children’s books. Her Master’s project, funded by the Social Sciences and Humanities Research Council of Canada, investigates representations of tigers in eighteenth-century menagerie guidebooks and William Blake’s poetry. Having recently completed an internship at Library and Archives Canada, she hopes to work further with special collections and archival material. Alyssa Currie est étudiante en Master à l’Université de Victoria, et sa spécialité est la littérature des xviiie et xixe siècles. Ses recherches portent à la fois sur la culture du livre, l’enfance et les changements sociaux ; elle s’intéresse plus particulièrement à l’illustration et la miniaturisation des livres pour enfants. Son projet de recherche, financé par le Conseil de la Recherche en Sciences Humaines et Sociales du Canada, porte sur les représentations des tigres dans les guides de visite des ménageries au xviiie siècle en lien avec la poésie de William Blake. Ayant achevé récemment son stage au Centre des Bibliothèques et des Archives du Canada, elle compte poursuivre ses recherches sur les collections spéciales et le matériau d’archives.